While honey bees don’t hibernate, they do remain in their hives throughout the Winter months, living off honey they made and stored last year. 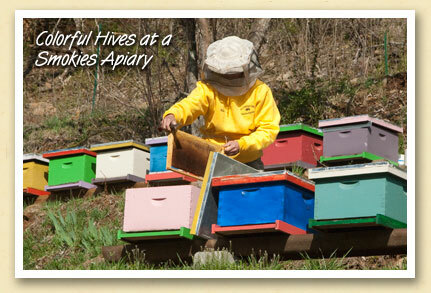 And now, with warmer days and budding trees, the bees at Balltown Bee Farm are finally emerging from their hives — officially confirming the arrival of Spring in the Smokies. In another rite of Spring, Balltown’s beekeeper Kelley Penn (above) carefully inspects each hive to see how the bees fared over the Winter. “Quite well,” she said. More than just bees, Balltown Bee Farm is a small, sustainable farm producing mixed vegetables, spring transplants and shiitake mushrooms, all raised chemical-free. You can find their products at the farmers markets in Bryson City, Sylva and Cashiers (in season).